Coffin Collectibles Unveiled: Get excited for Lady Death in 3D glory! 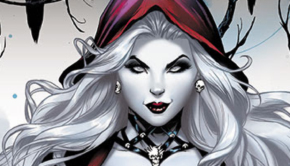 Great news for Lady Death fans. Coffin Comics just announced the creation of Coffin Collectibles, LLC. This new division will (you guessed it) handle the design and production of collectibles based on Coffin Comics properties. And the newly minted company is not opening its doors quietly. It’s launching with something big! 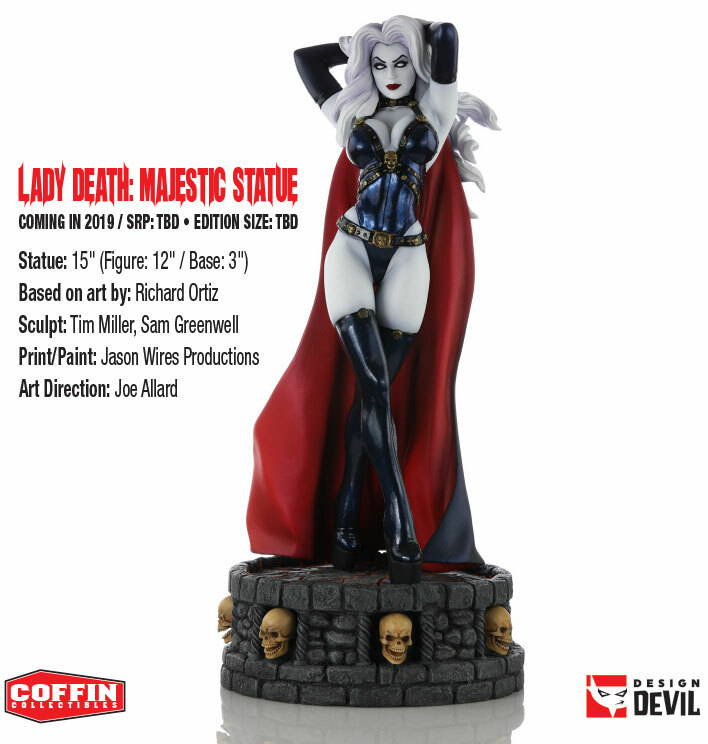 Look for the release of the Lady Death: Majestic Statue in 2019. It seems like an eternity since the last Lady Death statue came out. 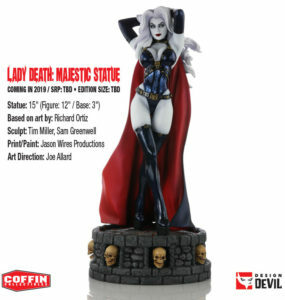 Based on the preliminary specs released by Coffin, this one will eclipse many of the previous statues of Lady Death. Standing at an impressive 15” (12” figure plus 3” base) high, this impressive statue of the death goddess is sculpted by Tim Miller and Sam Greenwell based on the work of top-notch Lady Death cover artist Richard Ortiz. It’s very similar to Ortiz’s cover for Dragon Wars # 1 Majestic Edition – and if you’re wondering if that’s the standard or the naughty version, you don’t have to; because Coffin will release both a regular version and a naughty version of the statue. Start saving your allowance or beer money, guys! But that is not all. 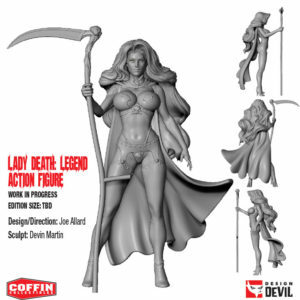 As if we had not already been spoiled enough with the release of the Executive Replica Lady Death Action Figure earlier this year, Coffin Collectibles has also announced its upcoming Lady Death: Legend Action Figure. There is not as much info available on this one yet, but the preliminary design work looks tantalizing. Joe Allard is credited for the design and art direction. Sculpting is by Devin Martin, obviously based on Richard Ortiz’s cover for Dark Millenium #1 Arcane Edition (or one of its variants, take your pick. They’re all hot!). Exact release date, pricing and edition size have not been announced at this early date, but it does not really matter. All that matters is that these great collectibles will soon take their place in our glass cases next to our Red Sonja Statue, Vampirella statue, Zatanna statue… or is that just me?